When I was in graduate school and living in Pasadena, California, I used to run marathons. When training, to avoid the worst of the horribly polluted air, I would typically rise before dawn and run in the Arroyo Seco, a canyon carved by the Los Angeles River. One misty morning, while descending into the canyon near the famous Rose Bowl, I gained a subtle perception that the trees, shimmering in a light breeze, were trying to communicate with me—not with spoken words, but as thoughts that came into my mind. They told me how hard they were working to purify the air we were polluting. I perceived their ethical judgement as well: We should change our ways and learn our planetary manners. I had an active imagination. So does the celebrated and multi-award winning novelist Richard Powers. 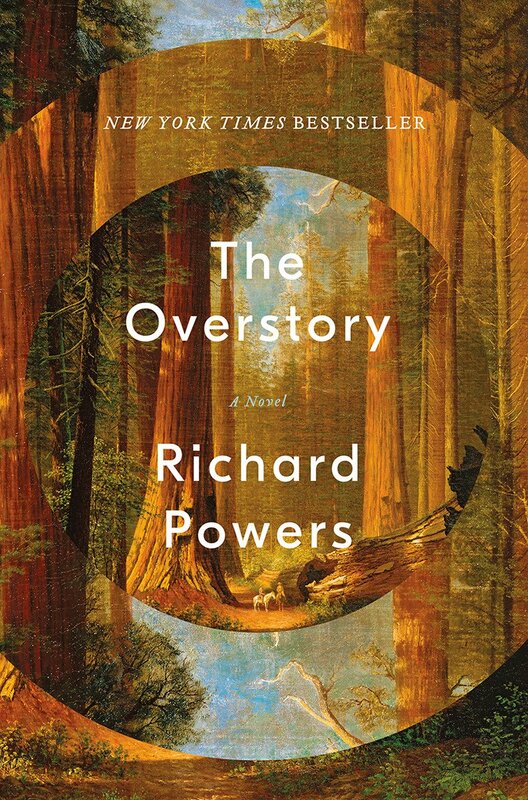 In The Overstory (W.W. Norton, 2018), Powers’ perceptions, questions, and views are expressed by his wildly innovative characters. One in particular, Dr. Patricia Westerford, is especially important. A little-known dendrologist, Westerford initially becomes famous after her controversial research findings—which reveal that trees and other plants communicate and defend themselves—were published in a book titled The Secret Forest. Apparently, Powers crafted Westerford’s character as a composite figure representing a growing number of researchers who have been illuminating just such ecological relations. Indeed, the title Powers invented for her book echoes the most popular books that have reported on such real-world research, including Colin Tudge’s The Secret Life of Trees and Peter Wohlleben’s The Hidden Life of Trees: What They Feel, How They Communicate. For Westerford, however, trees do not only communicate with one another, or with other species in mutual defense pacts or in other synergistic ways. Trees can communicate with human beings; they are “trying to get our attention.” Indeed, they “want something from us, just as we’ve always wanted things from them.” Although in the novel trees are the foremost non-human agents, through Westerford, Powers avers that not only trees but life itself wants something from us. This is the central contention in The Overstory: that entities in nature, and life itself, have agency, purpose, and personhood—and we have ethical obligations to all such persons. In Westerford, there is an entirely scientific and naturalistic path to this perception. For other characters, the path is more intuitive, sensual, and mystical. 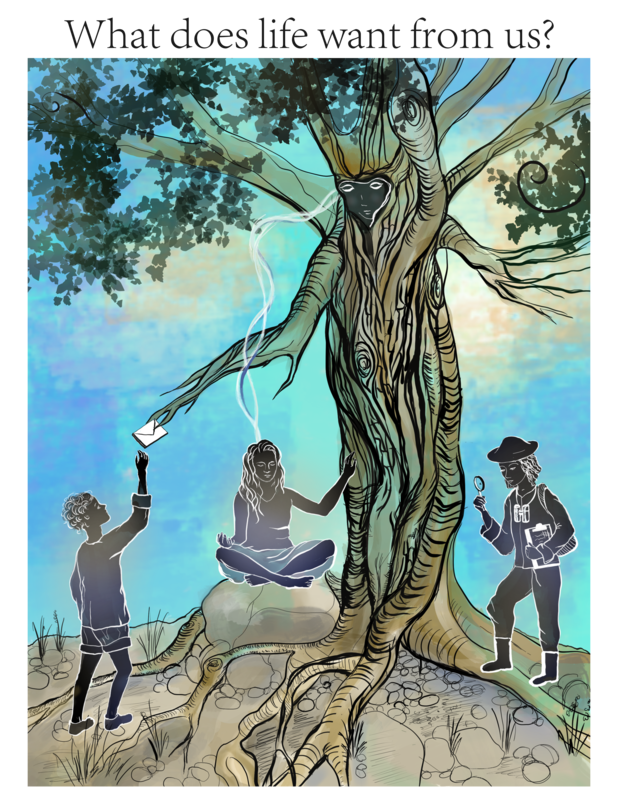 This latter approach is exemplified at the very end of the book, which depicts a collaboration between an activist who risks his freedom to protect a forest he considers sacred and a Native American and his son, who in their own ways feel similarly. Together, they labor on an artistic project in the forest, the premise of which is: if we will STILL ourselves, we can learn to listen to life’s multi-vocal chorus and thus discern what life wants from us. There is a spiritual epistemology here, whether the ways of knowing are scientific, mystical, or both. It involves discerning Earth’s sacred voices. Such spirituality has come to be called Animism. Animism is etymologically rooted in the Latin word anima, meaning life, breath, and soul. Today, it commonly refers to perceptions that natural entities, forces, and life forms have one or more of the following: a soul or vital life-force or spirit, personhood (an affective life and personal intentions), and consciousness, often including special spiritual intelligence or powers. Animistic perceptions are nearly always accompanied by ethical mores specifying the sorts of relationships that human beings should have with nature’s diverse forces and beings. Sometimes Animism involves communication and/or communion with such intelligences or life-forces or beliefs that these intelligences and forces are divine and should be worshipped and beseeched for healing or other favors. Animism generally enjoins respect for such intelligences and forces, promoting felt kinship with them. Rooted in such animistic premises, The Overstory explores a wide diversity of individuals who are striving to understand and respond to forest voices. Given my one-time experience perceiving, or imagining, the whispering of trees, it is unsurprising that I was seduced by the book. I typically find little time for novels. In all likelihood, I would have remained ignorant of Powers and The Overstory had he not referred to my own book, Dark Green Religion (2010), during an interview published in the Los Angeles Review of Books. Indeed, The Overstory is replete with the types of nature spirituality that I have called dark green religion. I will explain what I mean by the notion because I think it illuminates the cultural contexts that inspired The Overstory. I will also show how many of Powers’ themes and characters exemplify dark green religion or, as Powers put it in the above-mentioned interview, “the religion of life.” By not going into great detail when discussing the novel’s themes and plot twists, I intend to avoid spoiling its surprises and poignant moments. My goal is to bring into focus the novelist, the novel, and the habitats from which his characters emerged. I hope this approach will entice you to read it and, if you do, enrich your experience of it. Long before I entered The Overstory’s imaginative world, I began studying what I now call the global environmental milieu. By environmental milieu I mean the contexts in which environmentally concerned individuals—activists, scientists, artists, public officials, and a host of others—connect with and influence one another. When reading his novel and comments about my book, I surmised that, perhaps like me, Powers had been drawn to and into this milieu well before he drew on it for his work. Although within this milieu many differences and contentions exist, those within it tend to be receptive to one another’s ideas, and they also tend to position themselves in opposition to what they consider to be the destructive lifeways of the societies they inhabit. My studies examined a wide range of actors who express and promote such spiritualities, such as scientists and philosophers, activists and resource managers, artists and filmmakers, media producers, and no small number of nature writers and novelists. Moreover, I suggested that the growth of such spiritualities may presage the emergence of a new, global nature religion. I even speculated that dark green religious forms might eventually supplant older meaning and action systems because the dark green forms more easily cohere with modern scientific understandings than worldviews that were invented millennia ago and presume the existence of invisible divine beings. Powers set out to construct his arboreal, Gaian, and animistic myth by telling inspirational life-stories in which people “lose themselves and their private narratives in an unseen network of connections that runs far beyond their own small selves, even beyond their own species.” Yet more specifically, he sought to replace hubris and “human exceptionalism” with humility and to evoke kinship feelings between humans and other organisms. Powers clearly believes that the world is catapulting toward ecological and social disaster—and that a mythic transformation of human consciousness is necessary for there to be any chance to reverse the tide. He even confessed that, through The Overstory, he was “trying to resurrect a very old form of tree consciousness, a religion of attention and accommodation, a pantheism of sorts that credits other forms of life—indeed, the life-process as a whole—with wanting something.” Here we see the blending of Animism and Pantheism, or, if one prefers, Organicism or Gaian spirituality. Powers did not only draw on the environmental sciences, however. His characters were inspired by the three individuals who have sometimes been called the holy trinity of American environmentalism: Henry David Thoreau, John Muir, and Aldo Leopold. But more significantly, for many of his characters, Powers also drew directly from the life stories of many environmental activists and their campaigns. A number of these characters were directly modeled on, or composites of, redwood forest activists in Northern California. Earth First! activists Judi Bari and Darryl Cherney, for example, were campaigning to prevent logging in Northern California’s redwood forests when a bomb exploded in their car. They were subsequently accused of planning an act of “ecoterrorism” and making the very bomb that nearly killed them. Two redwood forest activists in The Overstory suffer a similar fate. In another obvious example of using movement figures as a muse for his creative imagination, Powers transmogrified the title of a song Cherney wrote—“You Can’t Clearcut Your Way to Heaven”—into a banner that is unfurled during an anti-logging protest. And like Bari, the character modeled on her does not approve of tree spiking, a tactic wherein activists drive metal spikes into trees to deter logging, because it could injure timber industry workers. I could spend considerable ink on other such apparent inspirations. A woman’s experience riding a towering redwood tree and communicating via some kind of mind-to-mind telepathic Animism resembles the experience of the most famous and telegenic of the redwood tree sitters, Julia “Butterfly” Hill. Just north of the redwood biome, the Earth First!ers and bioregionalists who formed the Cascadia Free State in Oregon in The Overstory become the “Free bioregion of Cascadia,” and the fortress wall that the real-world activists built to block the logging equipment also appears in the book, drawbridge included. The most famous arson attack ever undertaken by environmental activists in the United States was of a ski lodge under construction in Aspen, Colorado. They were motivated in part by scientific assessments that concluded the site of the new lodge constituted “critical habitat” needed by the endangered Lynx. In The Overstory, this incident is hybridized with several other arson incidents, including one in the state of Washington that was designed to thwart a government-funded effort to genetically modify trees. Powers amalgamated these incidents into his own story by having five of the novel’s activists torch a four-season resort in Idaho. Unlike the real-life version, in the novel a life is lost—but like reality, one of the perpetrators, after being apprehended by the FBI, subsequently wears a clandestine recording device and elicits incriminating admissions from another character. In the real-life case, the betrayer implicated several of his co-conspirators, many of whom served long prison terms, while another, soon after his arrest, committed suicide in jail. In the novel, only one of those from the arsonist’s cell is found and arrested, but where and how this occurs closely resembles what happened to Daniel McGowan, whose experience was recounted in a documentary that was nominated for an Academy Award. The eventually-arrested arsonist in The Overstory reacts in virtually the same way as McGowan. In both the real and fictionalized story, after setting the fire, the arsonist barely escaped as the fire rapidly and wildly spread, which convinced him that arson was far more dangerous and destructive than he had anticipated and led him to regret participating in the act. It is unsurprising, of course, that Powers would find in such dramatic life stories, and the global environmental milieu more broadly, valuable resources to imaginatively mine. I was surprised, therefore, by a disclaimer on the book’s copyright page: “This is a work of fiction. Names, characters, places, and incidents are the products of the author’s imagination or are used fictitiously. Any resemblances to actual events, locales, or persons, living or dead, is entirely coincidental.” This is nonsense. My reflections have shown specific ways in which the lives and campaigns waged by grassroots environmentalists, which themselves have often been highly original, inspired certain characters and plot lines in The Overstory. To my mind, it is inconceivable that the resemblances are coincidental. Moreover, this lawyerly statement is inconsistent and illogical because the first sentence acknowledges that the author may have “used fictitiously” real-life characters and incidents, which would not be coincidental, let alone entirely so. I am confident that Powers recognizes that there have been many contributors to The Overstory—that many lives have sparked his imaginings, including trees. On one misty morning, now long ago, I also thought I heard the whispering of trees. Others more spiritually adept than I may take such experiences as evidence of intentional communication from another species. I have come to understand my own experience naturalistically, as environmentally informed conjecture entangled with evolution-gifted imagination—perhaps precipitated by a flood of running-induced cannabinoids. Whatever we may conclude about such experiences—whether they come through mystical experience or our scientifically informed moral imaginations—it is well worth pondering the foremost question that Powers posed in The Overstory: What does life want from us? Colin Tudge’s The Secret Life of Trees: How They Live and Why They Matter (New York: Penguin Press Science, 2006) was originally published in 2005 in Great Britain by Allen Lane. Apparently, its first publication in the United States was as The Tree: A Natural History of What Trees Are, How They Live, and Why They Matter (New York: Crown Publishers, 2006). See also: P. Wohlleben (transl. J. Billinghurst), The Hidden Life of Trees: What They Feel, How They Communicate? Discoveries from a Secret World (Vancouver, BC, Canada: Greystone Books, 2016). Powers also may well have found inspiration in Nalini Nadkarni’s Between Earth and Sky: Our Intimate Connections to Trees (Berkeley: University of California Press, 2008), Matthew Hall’s Plants as Persons: A Philosophical Botany (Albany: State University of New York Press, 2011), and David Haskell’s The Forest Unseen: A Year’s Watch in Nature (New York: Penguin Books, 2013). For relevant works published after Powers could have drawn from them in The Overstory, see Wohlleben’s The Secret Network of Nature: The Delicate Balance of All Living Things (The Mysteries of Nature Trilogy (London: The Bodley Head, 2018), Stefano Mancuso’s The Revolutionary Genius of Plants (New York: Atria Books, 2018), and David Haskell’s The Songs of Trees: Stories from Nature’s Great Connectors (New York: Penguin Books, 2018). Some scholars refuse to use the word Animism because it was invented by E.B. Tylor, who considered animistic spiritualities inferior and primitive compared to Western monotheism. The word has now entered into common parlance and if carefully defined, as I have done here, the term can be used in a non-pejorative way. For good introductions to it, including its genesis and its contested nature, see D. Chidester, “Animism,” in Encyclopedia of Religion and Nature, ed. B. Taylor (Bloomsbury Academic, 2005), 78-81; and for a careful definition and defense of using the term, see G. Harvey, “Animism—a Contemporary Perspective,” in Encyclopedia of Religion and Nature, 81-83. See also G. Harvey, Animism (New York: Columbia University Press, 2006) and N. Bird-David, “‘Animism’ Revisited: Personhood, Environment, and Relational Epistemology,” Current Anthropology 40, no. S1 (1999): S67-S91. My definitions of Animism, Gaian spirituality, and dark green religion are adapted from B. Taylor, Dark Green Religion: Nature Spirituality and the Planetary Future (Berkeley and Los Angeles: University of California Press, 2010), 13, 15-16; the summary in B. Taylor, “Prologue: Avatar as Rorschach” in Avatar and Nature Spirituality, ed. B. Taylor (Waterloo, ON, Canada: Wilfrid Laurier University Press, 2013), 4-5; and B. Taylor, “The Sacred, Reverence for Life, and Environmental Ethics in America,” in The Oxford Handbook of Environmental Ethics, ed. S.M. Gardiner and A. Thompson (Oxford, UK: Oxford University Press, 2017), 248-61. I am loath to provide examples because there are so many. Any short list here would do an injustice to others not mentioned that are equally worthy. Instead, I will simply refer interested readers to the literary exemplars of such spirituality that I discuss in Dark Green Religion. J. Lovelock, The Revenge of Gaia: Earth’s Climate Crisis and the Fate of Humanity (New York: Basic Books, 2006). For the book in which he advanced his path-breaking theory, see Gaia: A New Look at Life on Earth (Oxford and New York: Oxford University Press, 1979). Cherney and Bari were soon released due to the lack of evidence against them. They eventually won a multimillion-dollar civil lawsuit against the FBI and Oakland Police Department after convincing a jury that their civil rights had been violated. For the story in her own words, see J.B. Hill, The Legacy of Luna (San Francisco: Harper, 2000). If a Tree Falls: A Story of the Earth Liberation Front, directed by M. Curry (New York: Oscilloscope Films, 2011), DVD. Recent research lends credence to the possibility that the often-spoken of “runner's high” may indeed have a biological basis; see, J. Fuss, J. Steinle, L. Bindila, et al., “A Runner’s High Depends on Cannabinoid Receptors in Mice,” Proceedings of the National Academy of Sciences 112, no. 42 (2015): 13105-8, https://doi.org/10.1073/pnas.1514996112. In “Salmon Speak—Why Not Earth?” I pondered, in a naturalistic way, the possibility that non-human organisms, and Earth itself, might speak to us. In a second essay—“Evolution and Kinship Ethics”—I argued that one can construct, from entirely naturalistic premises, a biocentric environmental ethics. Both these essays have affinity with the possibilities Powers advanced in The Overstory (especially through Dr. Westerford) and with phenomena I characterized as the naturalistic pole of Dark Green Religion. 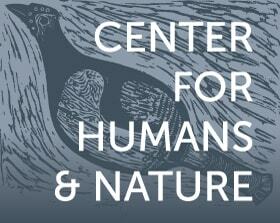 These essays can be found, respectively, at the Center for Humans and Nature website, at https://www.humansandnature.org/earth-ethic-bron-taylor and https://www.humansandnature.org/evolution-and-kinship-ethics.